Offering you a complete choice of products which include brown tapes. 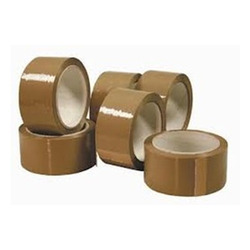 Being into the business of manufacturing and supplying a wide range of Brown Tapes. We have been able to serve our valued clients with an extensive range of Bopp Tapes. These tapes are highly acclaimed by the clients for expansive applications in safe packaging. Our range can be availed in different grades and sizes as per the requirements and demands of our clients.